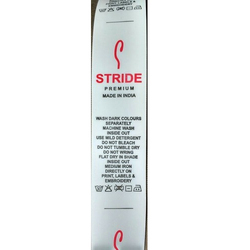 Offering you a complete choice of products which include wash care labels and bar code labels 1d. In order to carve the higher position in this domain, we offer a wide range of Wash Care Labels to our valued patrons. Our product range is made using taffeta and satin material and modern technology under the guidance of experts. Apart from this, these products are available in varied sizes and designs to suit needs of our customers. 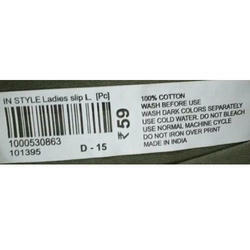 Our Company is the well-known name in the industry we are engaged in offering the best quality Bar Code Labels 1D. Our offered products are designed using finest quality taffeta and latest technologies. Our valuable clients can avail these products in latest patterns as per the requirement. In addition to this, these products are offered at very affordable rates. Looking for Wash Care Size Labels Bar Code Labels ?